Although she took a few years off running while in middle school, Gonzalez picked it up again in high school and has been a one-woman wrecking crew. 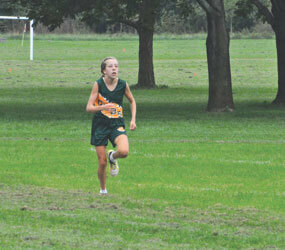 She capped the recent cross country season with an Interscholastic Athletic Association of Maryland (IAAM) title and a course record at Oregon Ridge Park in Cockeysville, where she covered 3.1 miles in 17 minutes, 59 seconds, 90 seconds ahead of Holly Cook of John Carroll. Gonzalez earlier won the Gunpowder Invitational, finished first in all six IAAM regular-season meets and finished second at the Mount St. Mary’s Invitational, and was honored as the Baltimore Ravens’ “Champions Athlete of the Week” at their Oct. 16 home game. As passionate and dedicated as she is to running, Gonzalez says the sport also has a calming effect on her, even in the midst of competition. Not only that, but Gonzalez says the familiarity she has with certain courses makes running them even more enjoyable. As much pleasure as Gonzalez finds in running the courses, she is equally as competitive while traversing them. McBride said Gonzalez’s competitive streak can also be found when she’s sitting still in the classroom. A member of St. Michael the Archangel Parish in Overlea, Gonzalez’s course load includes advanced placement U.S. History and honors courses in American Literature, chemistry and geometry. She is a member of the National Honors Society and the Ambassador Club, where she speaks to new students and guests at the school.